A beautiful and bespoke wooden bird table finished with a reclaimed Welsh slate roof and wood roof ridges. Hand crafted in our workshop in Lincolnshire, England using the highest quality sustainable sourced materials. All painted in a selected range of exterior eggshell Farrow & Ball colours. This beautiful bird table is suitable for a wide range of wild birds. All the slate that we use for our slate roofed bird tables is crafted using reclaimed Welsh slate. Seen by many as the best slate in the World for both its quality and unique colour. All of our Bird Tables are handcrafted with the Robinson Garden wooden mouse. Each mouse is hand carved in Bali, Indonesia to help support the Fair Trade initiative, World Fair Trade Organisation, the British Association for Fair Trade Shops and the Fairtrade Foundation. We have a wide choice of finials to create that added touch to your bespoke Bird Table. You can choose from the traditional finial collection which includes the classic Ball and Acorn or alternatively a Unique finial. All of our finials are made using sustainable and ethically sourced FSC approved wood. Each finial is also made from one single piece of wood preventing cracking and separation which is a common problem if the wood has been glued together from two or more pieces of wood. All of our products are personally hand delivered, ensuring that your order reaches you safely from our Lincolnshire workshop. We take pride in each bespoke garden product that we carefully handcraft in our Lincolnshire workshop for our clients. To prove that, we attach our plaque of approval onto the post all of our bird tables. 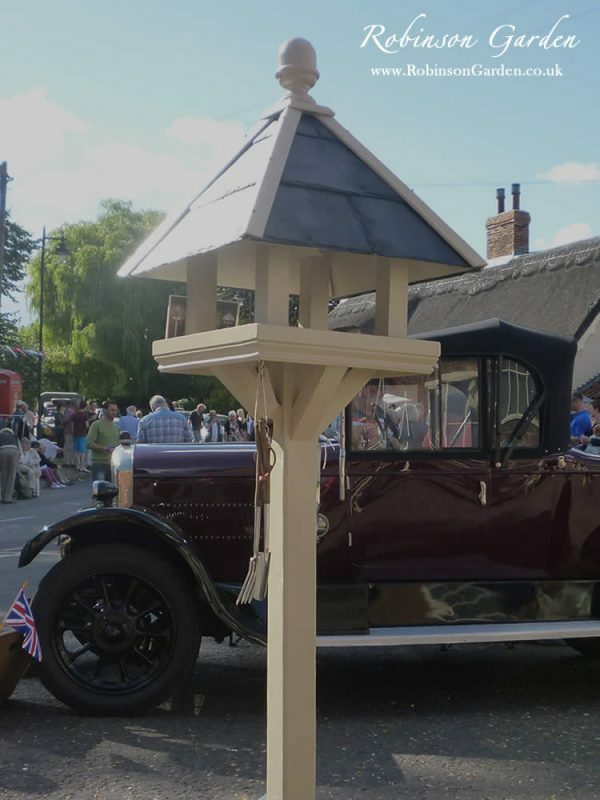 Each bespoke Bird table has been designed and handcrafted with strong supporting legs that take the weight of the bird table proportionately. Thus preventing the bird table from toppling over during the unpredictable British weather! Our carpenters hand router each Bird Table post to add to the elaborate and unique design. The routered post also makes it harder for predators climbing up the post offering more protection to your garden birds when they are feeding. Each Bird Table has a hook attached underneath the table platform to allow you to attach a bird feeder of your choice, creating the perfect feeding station for your garden birds. Is there a bird table aftercare guide? Yes, there is! Our Bird Table aftercare guide can be viewed by Clicking Here. What is the finial choice on bird tables? We offer three finial choices on our bespoke bird tables which are the ball, acorn or unique. As well as offering the traditional Ball or Acorn final we also offer the choice of a unique finial. Each unique finial is uniquely designed and handcrafted by our in-house carpenters using our top of the range lathes. If you choose a unique finial, our carpenters will choose a design based on their own design flare at the time. So rest assured, your finial will be entirely unique! What are the lead times on bird tables? For our current lead times, please Click Here. What wood are your bespoke bird tables made from? Our bespoke Bird tables are handcrafted using a range of softwood and hardwood. All of our timber is FSC Certified and hand picked by our carpenters from our local timber merchants. For more information on wood / timber that we use, please Click Here. What bird table designs do you offer? Our bird table designs can be viewed on our Bird Table product page. Click on the bird table to view the design. What bird table sizes do you offer? Our bird table sizes can be viewed on our Bird Table product page. Click on the bird table you like and find size dimensions. Do you offer other sizes to what is shown on the website? For made to order sizes please contact us via the contact form. Do you offer the choice to have a post that can go directly into the ground? Our bird tables have fully supporting legs as standard however if you would prefer your bird table to be placed into the ground we deliver your bird table with a Met post to allow you to place it into the ground. The cost for a met post is £20, please contact us if you would like a met post. How many hooks do you put on the bird table? We put one hook on our bird tables to allow you to hang a bird feeder onto the bird table. If you would like an additional hook, please write this in the notes section on the checkout page. Are there drainage holes on the bird table itself? The pitch of the roof is designed to prevent large amounts of water collecting on the table part of the bird table. There may be instances during adverse weather conditions that water may collect. If this happens we would recommend using a sponge to lightly soak up excess water if required. Do your bird tables fall over during bad weather? Our bird tables have been specifically designed so that the supporting legs are equally proportional to the height of the bird table which prevents the bird table falling over during everyday British weather. As the British weather is very unpredictable, during times of extreme weather or areas that we very windy you could secure down your bird table using bird table pegs. Will I need to secure down my bird table? How are your bird tables made? All of our Bird tables are uniquely handmade by our in house carpenters in our Lincolnshire workshop. Each of our bespoke products are crafted using handpicked sustainable sourced FSC certified timber from our local timber merchants. The timber is treated for wood knots and then painted in Farrow & Ball primer undercoat followed by a minimum of three coats of Farrow & Ball exterior eggshell paint of your choice. We use traditional carpentry methods from start to finish taking pride on delivering high quality British crafted garden products. How are your bird tables painted? All of our bespoke garden products are individually hand-painted using the traditional wooden paintbrush. This begins by undercoating each product using Farrow & Ball primer in the relevant undercoat tone. Once dried, this is then followed by a minimum of three coats of Farrow & Ball Exterior eggshell paint in the selected range of colours. We use genuine Farrow & Ball exterior eggshell paint on all of our bespoke garden products. Do you sell unpainted bird tables? 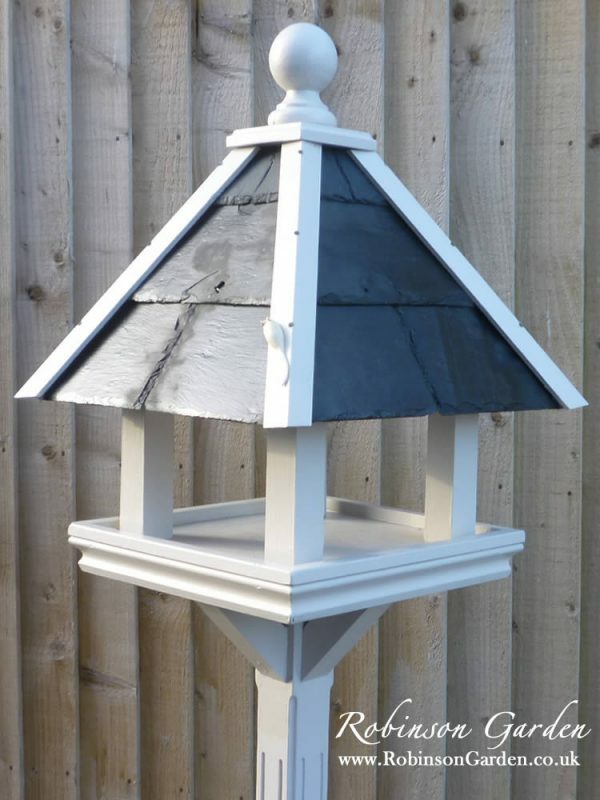 At the moment we only sell fully painted bespoke bird tables. Do bird tables require maintenance? Bird tables will require maintenance from time to time, for more details please Click Here to access the bird table aftercare guide. Do I need to assemble the bird table when it is delivered? All of our bird tables are hand delivered fully assembled allowing you to use your bird table straight away. If your order is delivered via courier, the wooden finial will be placed into a small box to prevent being damaged. The finial will have a double ended screw to allow you to twist the finial by hand into place once the bird table is positioned. We hand deliver our Bird tables all year round except during January and times of extreme weather conditions. Can I have a mouse on my bird table? All of our bird tables have our signature mouse added onto each bird table roof! Do you router the bird table posts? Yes! All of our bird table posts are individually hand routered by our in house carpenters. Do you have a bird table gallery? Our Gallery page can be found by Clicking Here. All of our products are individually hand-painted in genuine Farrow & Ball paint by our dedicated team in our Lincolnshire workshop. We ensure that each piece of timber is wood knot treated, applied with Farrow & Ball undercoat followed by a minimum of three coats of Farrow & Ball exterior eggshell paint. Please note that all these sizes are estimates and do vary depending on you finial choice. Lead times are estimates and can vary from season to season. If your order is being delivered please be aware it may take longer depending on how many orders we have near you. Our delivery schedules ensure we send out as many orders as we can in one delivery to help reduce our carbon footprint. For more information on accepted payment methods etc. please Click Here. We have put together a handy and useful product care and aftercare guide to ensure that your bespoke garden product is correctly maintained. To view the bird table aftercare guide, please Click Here. Having worked with premium paint for numerous years we have been continuously impressed with the high-quality paint that Farrow & Ball produce. The choice of colours complements our bespoke garden products, creating the perfect addition to your garden. Farrow & Ball’s water-based paints are a low odour, eco-friendly and safe for you, your family and pets to use. Farrow & Ball’s strong commitment to the environment complements our environmental goals including fully recyclable paint tins. Being as kind as possible to the environment is at the heart of both Farrow & Ball and Robinson Garden. Take a look at some of our related blog articles. Click on each article to view.